The lifeless body of the dog lay at the edge of the road. His grieving playmate, a Hungarian Pointer, lay beside him for several days, guarding the body of a close friend. The two dogs had shared memories of the previous few weeks, where they had had no food or water, in a cold suburb of Budapest. The scene was a heart-rending spectacle for a young man experienced in animal rescue, who passed this sight several times on his way to work. Finally, he could not bear it any longer. He got out of his car, walked over to the dog and spoke to the animal. The Hungarian pointer turned away his head, unimpressed even by the piece of bacon the would-be rescuer pulled out of his pocket. What else could be done? In a final effort to help, he tried opening wide the door of his car, and this worked: the dog was finally drawn in by this promise of help. He jumped onto the front seat, and nestled himself into it as naturally as if he’d always travelled there. When the young man arrived home, there was another complication: the presence of his own Doberman was like a rude awakening to the rescued dog. The two dogs did not get on with each other at all. A make-shift arrangement was set up to keep them apart, with a combination of locked doors and barricades constructed from furniture. This worked for the short term, but it wasn’t ideal: the barriers may have controlled the movements of the four-legged residents but they also hindered the coming and goings of the two-legged ones. It soon became obvious that this was not a long term answer and a desperate search for a new owner began. The young man’s efforts to find a home for the dog were not successful. The young man took the dog to a busy square in a final bid to solve the problem. After tying its leash to a bench, he stood back and watched people passing by from a distance. No one stopped; the passing crowds were indifferent to the dog’s plight. Twenty five years later, two dog lifetimes have passed. 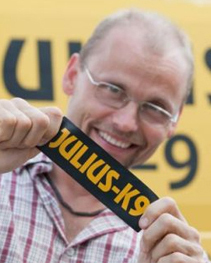 The young man in the story was none other than Julius Sebö, the owner of Julius-K9® and the inventor of the “speaking” dog harnesses, with customisable stick-on labels that carry messages. The incident of the Hungarian pointer had stuck in his mind, and in time, he realized that in his search for a new owner he had stumbled upon a new way of communicating information about animals to people. There was no doubt about it: messages from animals had to be translated into a language that humans could understand. 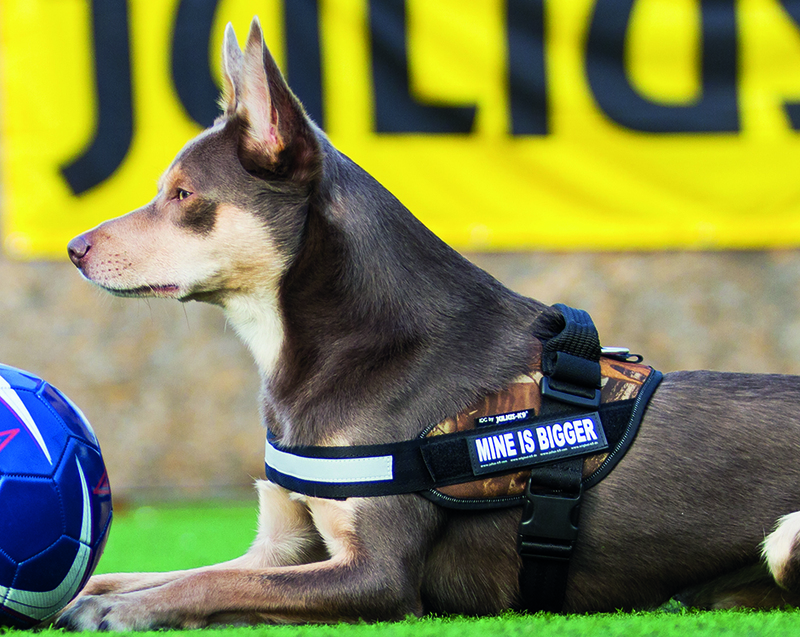 This idea inspired the birth of a global brand: a dog harness – with a replaceable message. The popularity of this concept around the world has exceeded all expectations; the initial surge of enthusiasm for the product has not dipped at all over the past twenty five years. These days, harness labels are produced by numerous companies, but they are still produced at exactly the same size as those early labels that were originally created for the first K9-Powerharnesses. 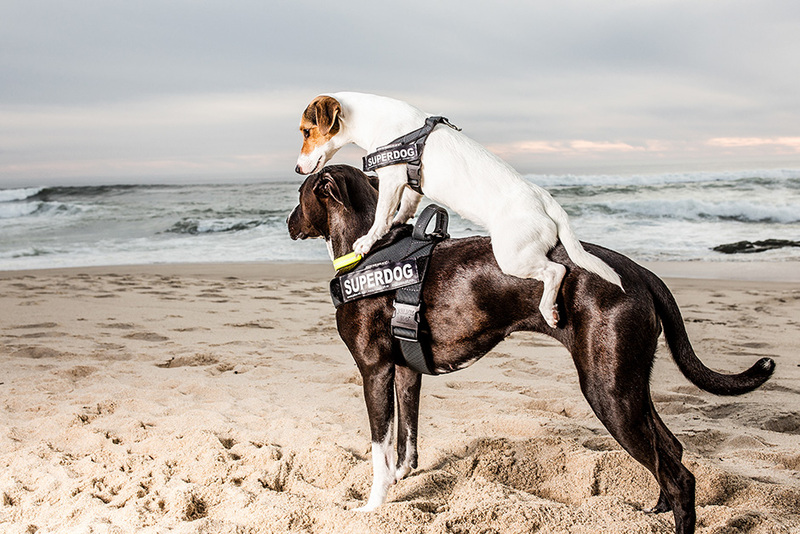 The impeccable quality of Julius-K9® dog harnesses was remarkable enough in itself, but thanks to the labels, the harnesses have been recognised as innovative information carriers since the start. Initially traditional service dog labels, like POLICE, ARMY, etc. were used. Then people started to use eye-catching phrases, like COOL MAN, MINE IS BIGGER, or MACHO on some dogs, and an avalanche of interest started. Passers-by took notice of the “speaking” dogs and, whether they were animal lovers or not, the dog influenced them – by communicating human thoughts! This proved that a simple innovation could do a lot to promote the widespread acceptance of dogs as companion animals. The reputation of Julius-K9® reached the far ends of the earth faster than production could keep pace with. It’s no surprise that this fashion craze prompted a number of Far Eastern copies, stimulating the need for further development of products by Julius-K9®, as well as legal action to protect the originality of the concept. 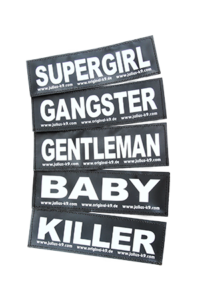 At the same time as the constant improvement of the dog harness design, the choice of labels is also rapidly expanding. If the Hungarian pointer found at the edge of the road was alive today, he could wear a unique label made specially for him. We at Julius-K9 are proud of the fact that we can talk about a Hungarian world success inspired by a Hungarian dog breed. And the product primarily helps the animal itself by letting people know that it’s carrying a message for them!